Lower Key Block Assy – Petersen Inc. The ITER project is “a major international research project with the goal of demonstrating the scientific and technological feasibility of fusion energy” (US_D_22H233 v2.7). At the heart of this incredible Tokamak is a Central Solenoid Structure that will house many critical components for the overall project including a Central Solenoid Coil that, as a complete unit, will become a Super Conductive Magnet. The Lower Key Block Assemblies will act as nine solid anchors to the Central Solenoid Structure and hold the Central Solenoid Coil in place. For each of these Lower Key Block Assemblies, the primary forgings for each unit includes both a Nitronic 50 Forging and individual Cooling Pipes that have been formed using very precise methods to maintain the overall integrity of each piece. A very specific welding approach was developed to meet the quality requirements for each unit. Along with receiving VT and PT inspections, these Cooling Pipes will undergo both individual Cryogenic Shock Tests and Helium Leak Tests. These Cooling Pipes will maintain the overall temperature of the Central Solenoid Coil and help the Super Conductive Magnet inside maintain stability. These Key Block Assemblies are critical to the overall Central Solenoid design and performance. 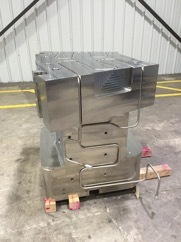 The Lower Key Block Assemblies consist of nine Nitronic 50 Forgings, thirty six Inconel 718 Machined Forgings, and several additional components that will be used and assembled together to ensure that the Central Solenoid Structure and Central Solenoid Coil are kept in place work properly. From The ITER Project’s website, we learn that the ultimate goal of The ITER Project is to pave the way for the future of Energy and Energy Research and the Lower Key Blocks Assemblies are vital to the success of this ambitious Fusion Energy facility. Lower Key Block Assemblies- Nine Assemblies consisting of six main individual, critical, components and several key subcomponents. Each component is precisely machined and fabricated to the specific requirements for each component.